Made-in-America quality, state-of-the-art ergonomic design, countless configurable options. 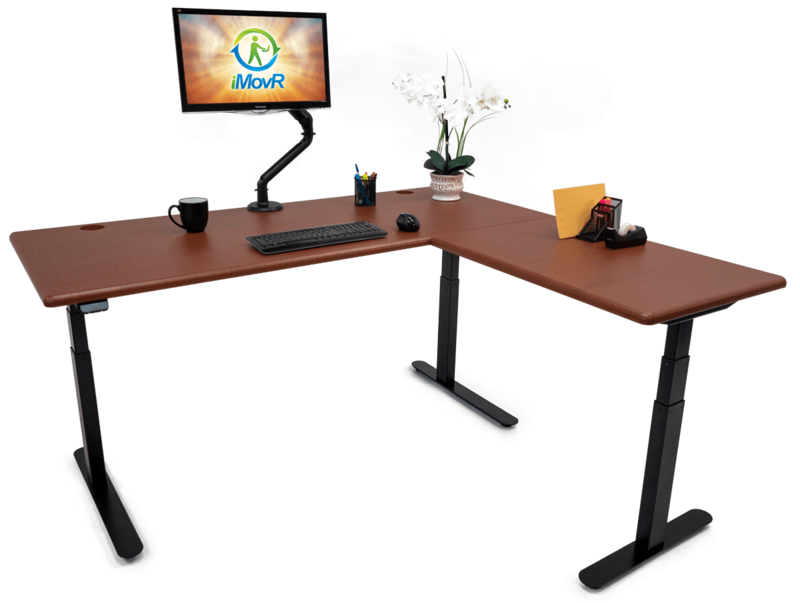 All iMovR Desks feature sleek, 3D-laminated tabletops and are built-to-order out of Michigan, USA. Choose yours today. 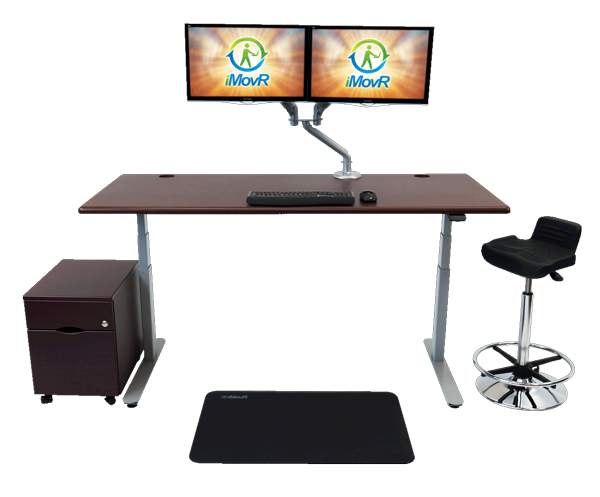 Visit Selecting the Right iMovR Desk for You for a buyer's guide to our desk lines. From compact desks for small offices, to the largest and highest-lifting desks in the market, we have a desk option for every application, décor, and budget. Discover which of our best-in-class desks is right for you. 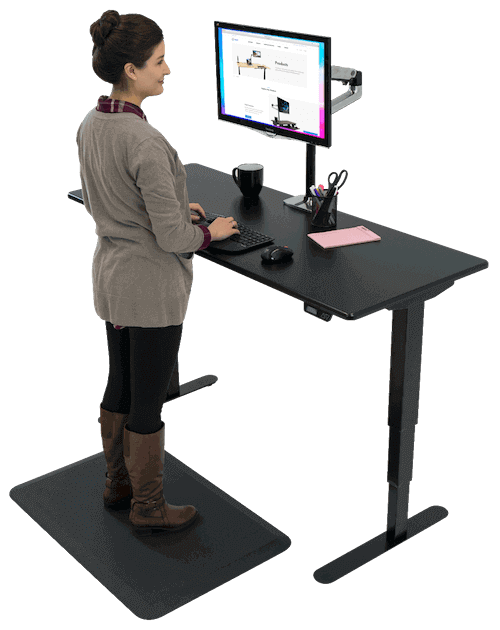 Standing Desks with iMovR's tilting SteadyTypeⓇ Keyboard Tray. For the most comfortable and productive typing experience while standing. Includes the Cascade and Lander w/ SteadyType® models. When each square foot is as precious as every dollar spent, it's time to turn to a Compact Standing Desk. 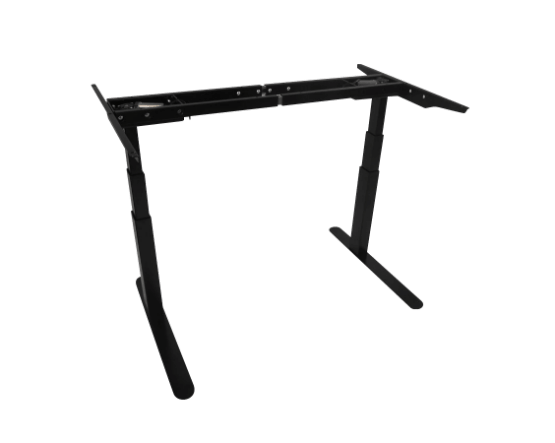 These slim 24" width desks will fit snugly in any Manhattan studio apartment, or a space-constrained corporate cubicle. Build your own Adjustable Height Desk. Whether you are in the market for a home office desk or a custom standing meeting table, our bases can accommodate an array of uses as well as users of all heights. Optimize your office space with an L-Desk or Corner Desk from iMovR. 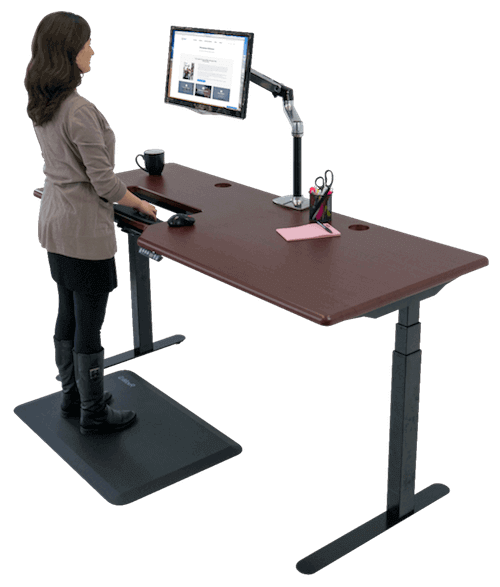 Perfect for cubicles, these standing desks provide maximum surface area so you have plenty of room to work. 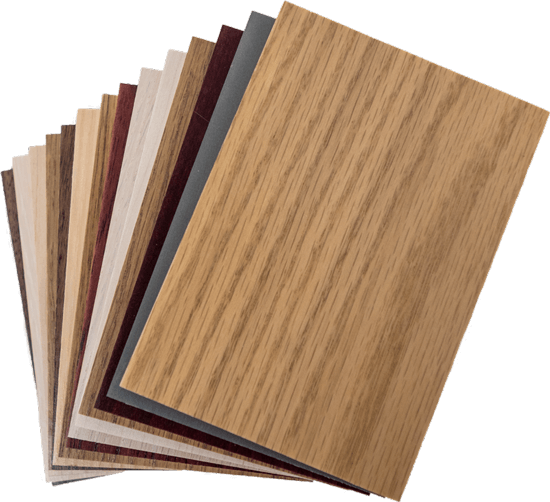 Choose from a variety of shapes and sizes to fit your office layout and match your decor with one of 16 3d-laminate finishes. 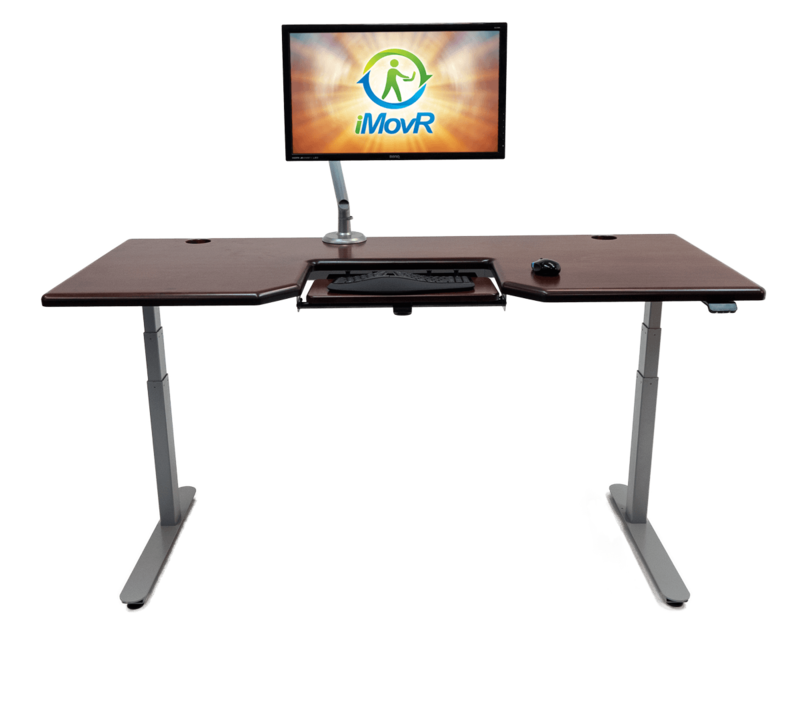 iMovR's standalone desktops and tabletops for homemade standing desks and DIY conference tables are all 3D-laminated and made in the USA. If you're looking for a perfect ergo-contoured top that can stand up to dings, scratches, and harsh chemicals, you won't find a better assortment of colors and sizes anywhere else. Leveraging robotic manufacturing for a revolutionary standing desk series that will have you standing your way. Our strongest, smartest, and quietest desks, the Landers are backed by the best warranty in the business and a 100-Day Satisfaction Guarantee. 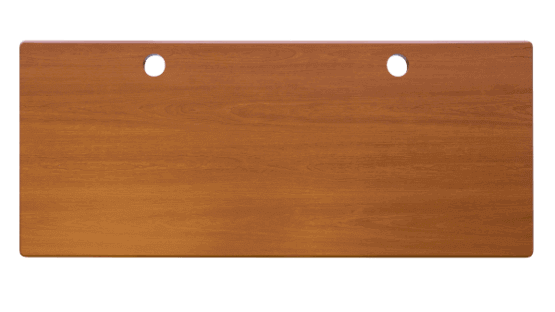 For the discerning customer looking for the very finest in modern standing desk furniture design, iMovR is pleased to offer the Lander Desk in 30 varieties of solid wood desktops. Find the perfect color combination for your standing desk and take your office from drab to delightful. With iMovR's physical color samples, you can test your tabletop and leg colors in your room of choice before you make your purchase. For complete guides to our tabletop finishes, see 3D-Laminate Tabletop Finishes and Solid Wood Tabletop Finishes. 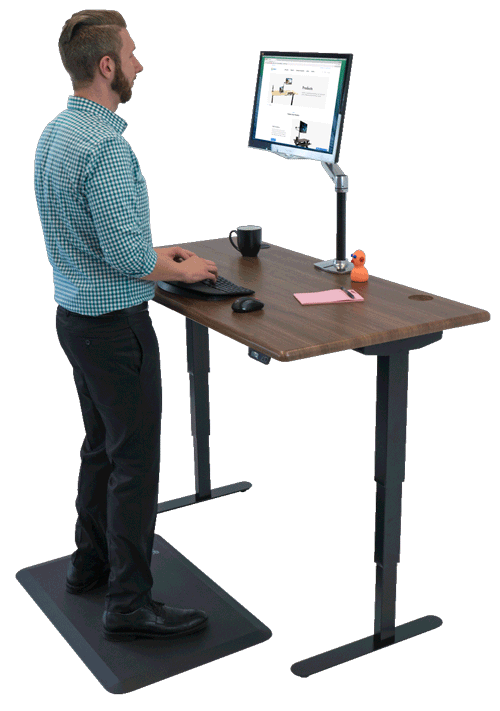 The most configurable American-made standing desk in the world—and at the price of an import. State-of-the-art robotic manufacturing techniques. Precision-crafted components. 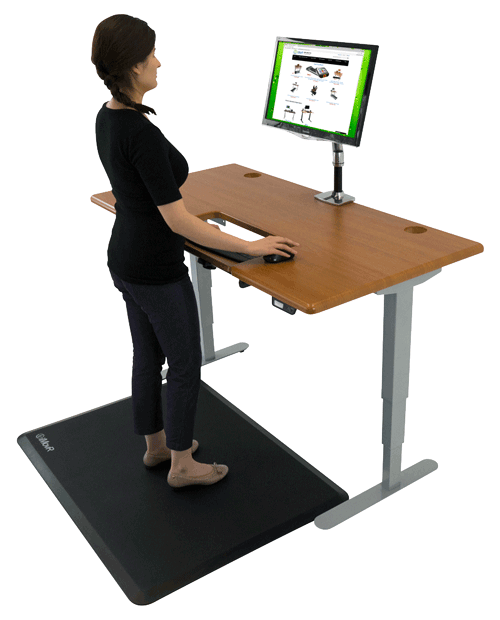 Kick-start your standing desk experience with the Energize™ from iMovR. The Energize Corner Standing Desk brings a smart, space-saving design to the world of adjustable-height desks. Featuring the same high-grade, made-in-America components as the Energize, this desk is loaded with configurable options from —all at the price of an import. 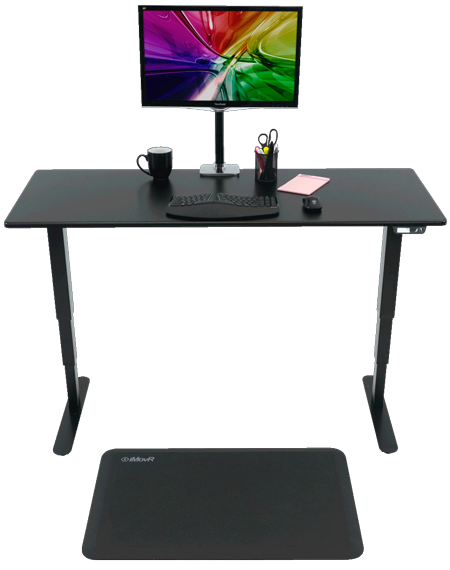 The Cascade Standing Desk from iMovR delivers made-in-America quality at an import price. Its built-in SteadyType keyboard tray provides ideal ergonomics for typing while standing or walking, setting it a bar above the competition. The key to its cost, quality, and high performance is our exclusive advanced manufacturing technology. The Cascade Corner Standing Desk brings a smart, space-saving design to the world of adjustable-height desks. A built-in SteadyTypeⓇ Keyboard provides optimal ergonomics while sitting, standing, or walking. Featuring the same high-grade, made-in-America components as the Energize, this desk is loaded with configurable options—all at the price of an import. Experience the health and productivity benefits of the Lander Desk in 30 varieties of elegant solid wood tops. Made entirely in the USA (Michigan) from sustainable US-grown species and honest materials, these tops are a testament to American quality craftsmanship. Experience the health and productivity benefits of the Lander Desk in 30+ varieties of elegant solid wood tops. Made entirely in the USA (Michigan) from sustainable US-grown species and honest materials, these tops are a testament to American quality craftsmanship. The key to our ability to offer literally thousands of customization options is our "Dell-style" mass customization production facility in Michigan. When you customize your desk system and select all your options, we produce the 3D-laminated tabletop and package your entire system for safe delivery in just one week. Choose from eleven popular colors, more shapes and sizes than you'll find anywhere else, or to add our patented, built-in, SteadyType keyboard tray. We'll even factory pre-assemble your desk for you if you'd like, so you can get standing that much faster. Why so many desk models? iMovR is also unique in the industry in that we do not rely on a single base vendor for all our desk models. We import the very highest quality bases made in Asia to create desks for the budget-minded customer, while using the very best bases in the world—made right here in Michigan—for customers who demand the most capable, reliable, and elegant adjustable-height desks. Innovation in product design and production is key to our brand, but so is our unmatched sales and support expertise. Our highly-experienced workplace wellness solutions specialists are always on hand to help you figure out the best configuration for your needs, and our customer service team is the best in the industry. Your satisfaction is always guaranteed.